Sure to bring birthday greeting with a hug, this is a 12-inch plush bear wearing a "Happy Birthday" t-shirt. This Birthday Bear from GUND is sure to bring birthday greetings with a hug! 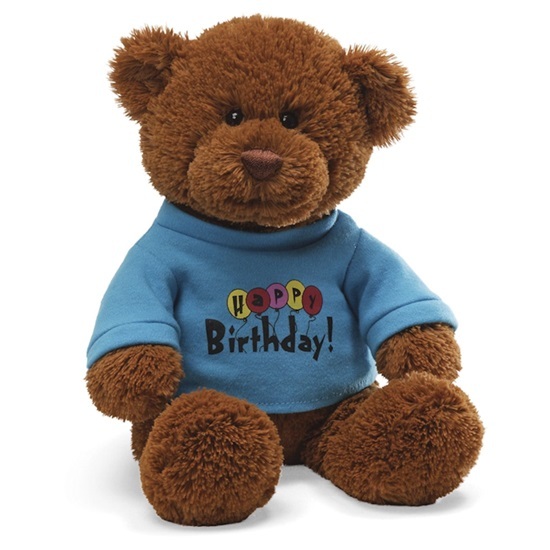 This 12-inch plush brown bear is wearing a blue cotton/polyester t-shirt with "Happy Birthday" printed on the front. He is surface washable and good for ages 1 and up. The t-shirt is removeable for ease in cleaning.